VANCOUVER – Valemount Glacier Destinations Ltd. received its Master Plan approval today from the British Columbia government. The Master Plan envisions a new, iconic mountain sightseeing and sporting destination in Canada. 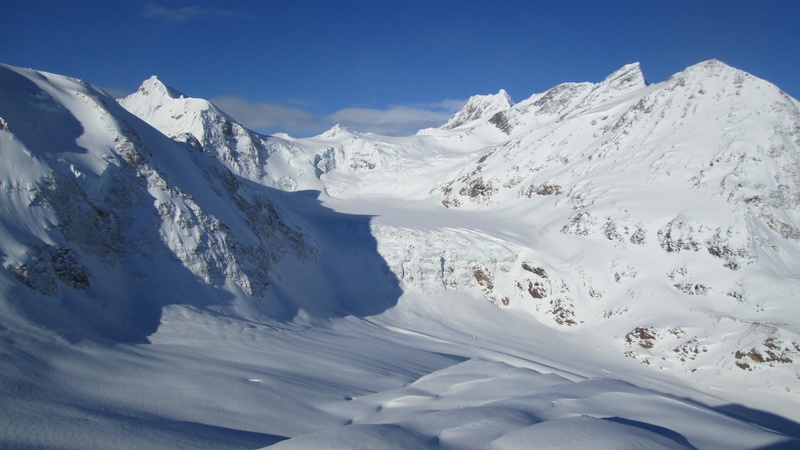 At build-out, it will provide sustainable public access to large glaciers at over 3,000 meters (9,850 feet) elevation – the only such access in North America – and will have a vertical drop of approximately 2,050 meters (6,726 feet), the largest in North America and third largest in the world. It is expected to become a major sightseeing and year-round skiing destination welcoming visitors from the nearby National Parks and from around the world. This is one of the rare available sites for new mountain resort developments in North America. The project team thanks Minister Shirley Bond (Prince George – Valemount MLA), and the Mountain Resorts Branch for today’s announcement, which is the culmination of four years of tireless work together with the proponent group. Valemount Glacier Destinations has drawn unprecedented public support over many open houses and public meetings. “It has been inspiring to work with our partners, the local people who will be welcoming visitors to their magnificent land. We thank Valemount mayor Jeanette Townsend and her Council, former mayors Andru McCracken and Bob Smith, McBride mayor Lorrane Martin, the Valemount Ski Society and the people of Valemount and the Robson Valley, whose initiative and enthusiasm have been a major driving force,” says Oberti. The project is located in the Premier Range, within the traditional territory of the Simpcw First Nation, whose support and partnership have been integral to the project since its beginning. “We have appreciated that Chief Nathan Matthew has seen the promise of a significant tourism destination to enhance the prospects of the Simpcw”, says Oberti. Already, the Simpcw people have contributed extensive work through Estsek, their environmental consulting company. The project has undergone a harmonized approval process, with the Regional District of Fraser – Fort George processing an Official Community Plan Amendment and rezoning in concurrence with the Master Plan review process. Local MP Bob Zimmer has also encouraged this project, which will show visitors the extraordinary beauty of northern British Columbia. The next steps are the completion of a Master Development Agreement with the province as well as imminent completion of the rezoning and Official Community Plan amendment process with the regional district. Construction is expected to begin in the spring of 2017, with an ultimate public opening in December 2017.